After reading an article re Edinburghs "forbidden" gardens i thought about trying create some images of those spaces. The OSM data is a bit lacking in detail though and distinguishing between household private gardens and those described is not easy just now. There is a Barrier=fence data tag for some of the spaces but not in general . So instead i decided to play with the parks differences between some cities. 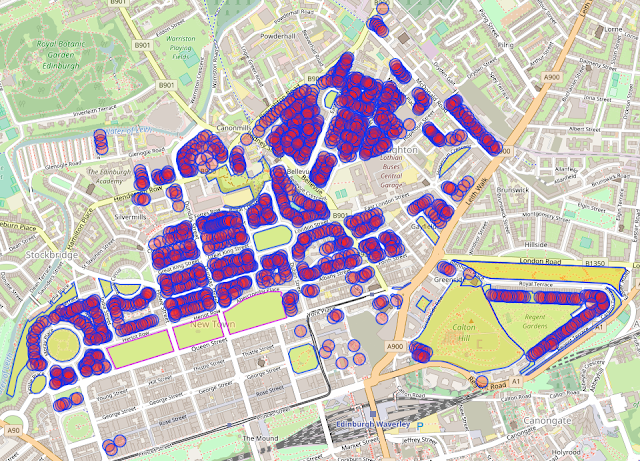 Using a query of the form "leisure=park in X" where X is a particular city on the Open Street Map data. Exporting to geojson, Then into QGIS to change coordinate frame ( EPSG 3857 ) and export to DXF. DXF imported to inkscape and scale the shapes to a common scale. Export and use svgnest/deepnest to sort the objects in a standard box.